Every child is important, and grammar schools conflict with that belief? The Church of England wants schools that meet the needs of all pupils, and grammar schools have no place in a framework of educational diversity? They’re prioritising schools for the whole community, and grammar schools are elite, aloof and anti-society? They seek to serve the needs of the many, and that necessitates ignoring the needs of the academically-gifted few? What is wrong with educational provision tailored to the the needs of the few? ..in bidding for new free schools we are putting our emphasis on exploring what more we can do for those who need outstanding special education or alternative provision and those who so often get left behind by society, as well as those who should have access to education which develops their vocational or technical skills.. This is interesting. The Church of England is perfectly content to foster new schools for the few if those few are (say) behaviourally challenged or require intensive learning support, or if their talents are suited to laying bricks, welding pipes or developing designs to improve aviation engineering. New vocational schools – or University Technical Colleges – have moral virtue, it seems, despite manifestly not catering for all. But new grammar schools.. well, they’re a regressive, elitist ‘Tory ideology’, and we can’t be seen to be promoting that, can we? Good Lord, no. Note how the Bishop of Liverpool, Paul Bayes, punctuates his tweet. He grinds his teeth in contempt with each word: every full stop leaves a fleck of spittle on the face. There could be nothing more socially immoral and educationally regressive than the contemplation of new grammar schools. 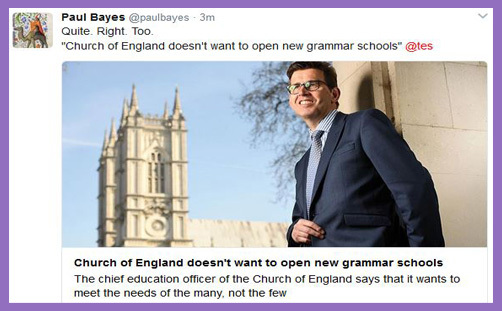 He doesn’t say what he wants the church to do with those grammar schools it already runs – does he want them closed down? If not, why not? If there is virtue and delight in their existence, what is so repugnant about spreading the provision to other towns and cities, to serve the whole community? Why is it Christian and moral to select children for a vocational education, but not for an academically rigorous one? “Our vision addresses the challenges our society faces and offers education for wisdom, hope, dignity and community that will lead to the flourishing of every child we serve,” writes Nigel Genders, apparently oblivious to the fact that grammar schools also address some of those challenges, and can offer just as much wisdom, hope, dignity and community as any comprehensive or vocational school. It’s a question of leadership, ethos and culture. But for the Bishop of Liverpool, there is simply no debate or discussion to be had: he just spits on the idea. The thing is, research by the Sutton Trust tells us that 86 per cent of Church of England bishops were either privately or selectively educated: 50 per cent attended a private school; 36 per cent attended a grammar school. Only 14 per cent were educated at a comprehensive school, and the Bishop of Leeds is evidently proud of the fact that he is one. Where was Paul Bayes educated? Good question. It doesn’t appear to be in the public domain. Not that the educational preference of one’s parents negates the expression of a contrary opinion. But it is interesting that private and grammar schools manifestly worked for a whopping 86 per cent of bishops, and now, here they are, preaching the superior Christian virtue of “schools that are meeting the needs of all pupils”; of “serving the needs of the many, not just the few”, and these must be state-run comprehensives. Where do bishops send their own children to be educated? That’s a good question for someone who has rather more time. It is worth noting that the universal comprehensivisation rolled out in England and Wales since 1965 was accompanied by falling standards and a worsening of results, with thousands upon thousands of children leaving school without even basic levels of numeracy and literacy. Many Local (Education) Authorities were seemingly utterly indifferent to this chronic failure, partly because the word ‘failure’ wasn’t in their educational lexicon. This isn’t a ‘Tory’ perspective, by the way: Jim Callaghan (bravely) ventured a critique as far back as 1976 in what became known as his Ruskin Speech. This set the foundation for the Thatcher/Baker reforms of 1988, and they in turn set the foundation for the Blair/Adonis/Blunkett reforms of the 2000-2, which in turn set the foundation for the Cameron/Gove expansion of academies and the establishment of free schools. Grammar schools are simply a continuation of the proliferation of educational diversity, to give parents more choice, which, it is posited, creates a rising tide to lift all boats. It has been empirically established that where governments demand equality of outcome over equality of opportunity, and are more intent on social engineering with prescriptive initiatives and micro-management of process, the effects are damaging to generations of schoolchildren and detrimental to society. In fact, 50 years of mandatory comprehensivisation has succeeded in restoring a privately educated ruling class. Just 7 per cent of the population attend private schools, yet they account for 75 per cent of judges, 70 per cent of finance directors, 50 per cent of top journalists and 33 per cent of MPs (among Conservatives, the figure is closer to 50 per cent). It does not matter how many brown-skinned Brummies become bishops or how many one-legged lesbians are adopted for safe Conservative seats, a disproportionate number will have been privately educated. For he that hath, to him shall be given even more: and he that hath not, from him shall be taken the very means by which he might one day hath haved. Grammar schools have been the most dynamic and successful motor of social mobility ever conceived. Up until Theresa May’s announcement, every major political party was dedicated either to their constriction or eradication: they were all intent on abolishing the meritocratic principle by which they were defined. The Church of England was happy to support this, while plucking its bishops from the elite. The rich have always sent their children to private schools, and the not-so-rich have scrimped and saved in traumatic attempts to spare their own children from the inadequacies and deficiencies of a system they half endured. When there was a grammar school in every town, entry was on merit, irrespective of parental income or social class. And the poorest could rise to attain the highest: the sons of miners could become a Nobel prize-winner and the daughters of grocers could become prime minister. Now, of course, entry to the grammars is as restricted as it is for private education: while the latter is dependent on the ability to pay the fees, the former is dependent on the ability to afford a house in the catchment area. Theresa May simply wants to address this manifest inequality. Social mobility has nothing to do with the egalitarianism of Socialism – economic equality or equality of outcome. Sadly, there will always be those for whom aspiration causes social division and so must be abolished. But social mobility is inherent to meritocracy which is (or ought to be) foundational to Conservatism (though challenging to conservatism) because it is dependent on equality of opportunity. And that opportunity must be available to all. In order for there to be grammar-school boys and girls to compete fairly with the privileged Old Etonians, there simply needs to be more grammar schools to provide the bright working and lower middle class child with opportunities equal to those of private schools. Why can’t the Church of England forge an educational ethos which praises the achievement of grammar schools? They run three of them, so patently don’t consider selecting by academic ability to be immoral or anti-Christian. Michael Gove saw the need for a revolution. He understood that the ‘best jobs’ (like bishops) should not be the preserve of the privileged élite (or 86 per cent of them): they should be open to everyone with the ability, irrespective of social class or economic circumstances. The consensus now is toward more competition in the supply of school places, and that leads logically to vouchers which could precipitate a great wave of social mobility – for wisdom, hope, community and dignity. Comprehensive schools ‘for the many’ can ignore the needs of ‘the few’, especially if those few are victims of the need to focus on raising GCSE grade Ds to Cs, for league-table imperatives. Driving the Bs to As and As to A+s simply becomes less of a priority (or not one at all). Instead of spitting at grammar schools, the Church of England might consider that inequality is the natural order of things. Just as ugly people are barred by nature from beauty competitions, and the tone deaf from joining the choir, so those who are not academically-inclined may be separated from those who are and provided with an education tailored to their needs. It is called ‘personalised learning’. It is not possible to teach excellent bricklayers and outstanding poets at the same pace in the same group of 30, for the lowest common denominator will prevail, and this negates potential. Grammar schools are part of the solution, and Bishops shouldn’t let their visceral anti-Tory ideology impede the provision of an excellent education for every child. The Palm Sunday massacre targeted Pope Tawadros II – why the media silence?